When people ask me "what do you do for a living? ", I smile and tell them I am a Dog Behaviorist. Usually they will say, "you mean a dog trainer?". I then respond, "no, more of a PEOPLE trainer for their dog". Before becoming a Bark Busters trainer, I was a television marketing director for 10 years. Then I obtained a Masters Degree in Education and spent 13 years as a principal and teacher in private schools. At that point I went on a personal adventure to decide what I wanted to do with the remainder of my working life. In reviewing my primary interests, I realized how much animals had played an important part in my life both as a child and an adult. I remembered how animals were always attracted to me, seeking comfort and affection. And since I had always had a dog in my life, I began to look for a way to have my own business that involved helping people and their dogs. 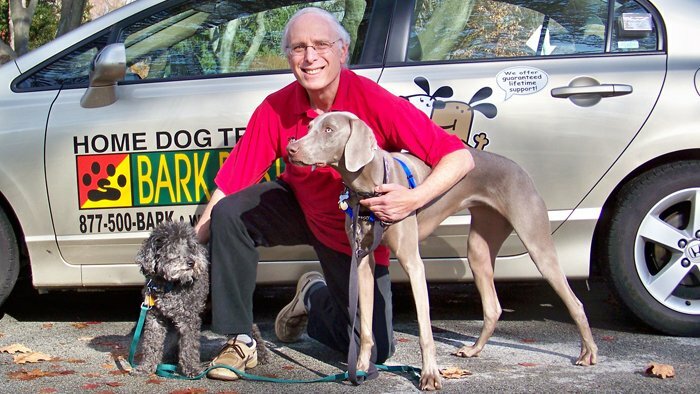 After many months of research it became clear to me that Bark Busters Home Dog Training offered me the opportunity for a satisfying new career helping both people and their treasured pets using the most humane and natural methods. There's not a day that goes by when I don't use my educational background in working with my clients and their dogs. Because I am educating the humans in the household on how to be their dog's leader, I am giving them the lifetime tools for a wonderful and fulfilling relationship with their dog. I often ask my clients a question: "What was the worst day you spent with your dog?" After they answer, I ask them, "what was the BEST day you ever spent with your dog?". Then I tell them I am going to give them the way to have far more of the later than the former! I really appreciate the time Donald took to explain and demonstrate techniques to gain control over situations. He also explained a little about why dogs act the way they do and how I should respond. Zoey has made so much progress. I would recommend to anyone who is having trouble with their dog. We are so happy with Donald! We saw a difference in our dog right away, he taught us how to speak to her correctly to calm her anxiety. She's very calm and well behaved! I highly recommend! We had issues with Chewy chewing and pulling. Donald came over to our house and explained patiently on how to address the issues. He also provided some free goodies like a collar, a spray bottle, and more! Our puppy is behaving a lot better after receiving help from Donald. Highly recommend him to anyone who have similar puppy issues! Donald has been very helpful in suggesting strategies and techniques to help us work with Moe. We rescued Moe (pitbull mix with basset hound) and he is very aggressive towards other dogs and has a lot of attention issues. So far, we have made some progress in the right direction and I look forward to more sessions with Donald.